I like Tacit. It alludes at a sensible freshness. Aesop’s mantra lies in intelligence – a smart, trendy brand without trying too hard. They don’t set themselves dreams: they create objectives. They make science seem like romantic artistry, and create an attainable alchemy for the masses, typified with stern amber bottles and scientific labelling. Science is a process of discovery. An exploration of what is otherwise already there. In Tacit, Aesop (through perfumer Céline Barel) rediscovers the Eau de Cologne and gives it a new interpretation in a stronger, more astringent format with a greater body. It revives an otherwise classic format: citrus and aromatics, naturally. Tacit defies commonality with a new style maintained within the same general structure. Hone in on a riviera lush with what Aesop describes as perfumed vegetation – trailed with salty sea spray and a touch of aggressive warmth, expected in a seaside scenario. In convention breaking style, Aesop has switched the usual bergamot-lemon top note with yuzu, a citrus that meets somewhere in between a grapefruit and a sour lemon. On first application I detect a sweeping breath of what I think is angelica and juniper. It is intensely aromatic, flattened sparsely with the yuzu note. This uncertainty; the wavering between what is certain and uncertain, lies within the backbone of both Tacit’s structure and its shaping as an idea. This note pulls back into the heart of the fragrance, featuring a novel use of basil (in the Grand Vert variety). This category of basil, a sweet one, contains within the majority of its structure methyl-chavico with a touch of linalool. It is naturally reminiscent of phenols and bitter camphors, with healing associated smells of warm clove, anise, fennel, and spicy greenery. Within Tacit and on the bare skin, this basil note reinforces a saltiness through its liquorice facet, and alloys itself with a heart of vetiver adding unctuosity, depth, body, and a further sea spray impression with a distinctive agrestic terrain note. It is uptight, clean, hinting further at a greater cleanliness through a cool mint and possibly geranium. Without an aptitude for precision, Tacit may have been too aromatic and natural smelling for proper enjoyment. At times, it pierces at the olfactory nerve but otherwise is largely restrained. It is a washed smell, but not a clean one. For instance, the elusive hesperidic impression central to this revivified cologne draws into the background, losing its grapefruit and mandarin nuances in favour of a static and sharpened nondescript citrus note. The basil too is strong, expanding rapidly across the structure and permeating it, but then it itself loses clarity as the translucent woods take over. It is warm and vegetal, refreshing, but the sentiment in my review before this reveals that sometimes refreshing and long lasting is a double-edged sword. I visit(ed) Tacit with the smell of Aesop in mind – featuring products made from great ingredients with equally great smells as a result. Tacit surely opens with this – a forward and back styled scent that is both obvious and nuanced within this obviousness. But then it loses all that. But, this is me being very nitty gritty with an otherwise dependable and solid offering from a superb house. If the smell of remedy is what one looks for, then this does an apt job of it. …and our senses allow us to be scrupulous! 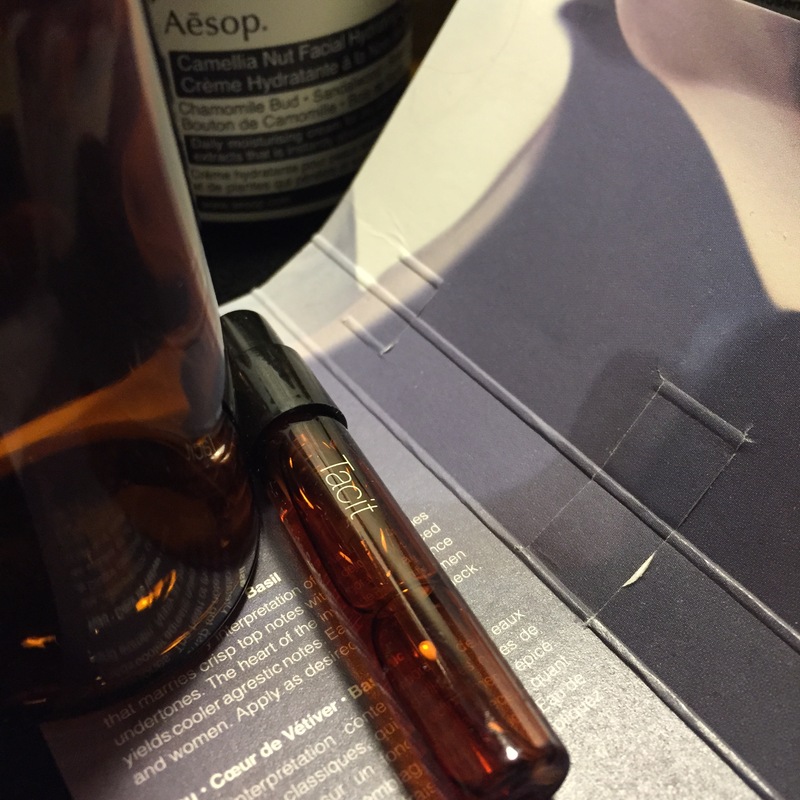 This entry was posted in Aesop and tagged Aesop, Fragrance, fragrance review, Perfume, perfume review, Review, scent, Tacit. Bookmark the permalink. I’m curious to try this one! Yuzu is one of my favourite smells and flavours – reminds me of wonderful times I had travelling in Japan! It’s very interesting Melita. I enjoy the opening, but it fades into an aromatic / clove-driven masculine scent. I’m into my grandmother perfumes anyway… If you catch my drift.